Abrea, as founding president of Center for Strategic Reforms of the Philippines, advocates the empowerment of entrepreneurs and business leaders by informing and educating them about tax-related issues. In his State of the Nation Address (SONA) last July 25, President Rodrigo Roa Duterte spoke of the need to lower personal and corporate income taxes. Indeed, after a consultation with key business leaders last June, tax reform is now a top priority in the 10-point socio-economic agenda of the Duterte administration. To pave the way for genuine tax reform, a comprehensive tax reform package will be completed and submitted to the House of Representatives in September. Tax reform advocate Mon Abrea of the Abrea Consulting Group (ACG), also dubbed the “Tax Whiz” and one of the proponents of this proposal, lets us in on the possible changes that might happen to the country's 30-year-old tax system with the comprehensive tax reform package. For most Filipinos, tax reform can only mean lower income taxes. The package includes provisions to lower both individual and corporate income tax to 25 percent, down from 32 percent. “Why 25 percent? Because it is the average income tax rate among members of the ASEAN (Association of Southeast Asian Nations). How can we fully participate in the economic integration if we have very high tax rates compared to our ASEAN neighbors?” explains Abrea. “It is unfair to squeeze out huge amounts of taxes from such a narrow taxpayer base,” says Abrea, which is why part of the package are provisions on how to broaden the taxpayer base. This move will also offset any revenue loss from the lowering of income taxes, he adds. Abrea says that the Philippines has a narrow taxpayer base because there is still a huge number of professionals and business owners who haven't registered themselves as taxpayers under the Bureau of Internal Revenue (BIR). “An already narrow taxpayer base, together with unreliable and perhaps outdated taxpayer information, are the major reasons why the BIR remains inefficient in collecting taxes,” he adds. Part of the provision to broaden the country's taxpayer base is to update the role of the Revenue District Offices (RDOs) from being primarily tax collection offices to taxpayer assistance offices. “To broaden the taxpayer base nationwide, we need registration assistance and taxpayer information rather than tax audits and assessments. We can increase voluntary compliance from taxpayers by assisting them properly rather than threatening them with penalties,” adds Abrea. Taxpayer information should not be limited only to the BIR, says Abrea. Most government offices also require taxpayer information, such as the Department of Trade and Industry (DTI), the Social Security System (SSS), the Government Service Insurance System (GSIS) and even the Philippine Overseas Employment Administration (POEA), among others. Abrea notes that these government offices often have unreliable, if not conflicting, taxpayer information. So part of the comprehensive tax reform package is also the provision to streamline the tax information database among the different government offices. “We have to maintain integrity of the information among these government offices,” he adds. Another provision is for a “tax holiday,” or a tax amnesty program. Under this proposed tax amnesty program, taxpayers will be pardoned and allowed to make amendments and declarations for any tax violations made from a specific period of time up to the present. Abrea believes that this “tax holiday” is a better course of action than, say, threatening taxpayers with penalties and tax evasion cases. “The BIR will be able to collect more taxes from the previous taxable years, as this [tax holiday] actually promotes voluntary compliance among taxpayers,” he adds, which in turn will also offset any possible revenue loss from the lowering of income taxes. The proposal also accounts for simplified processes for tax registration and collection, says Abrea. For example, for small business owners, tax registration with the BIR and business registration with the DTI can now be integrated into one registration. This kind of integrated registration for small businesses, for example, can also be done through the GoNegosyo centers and not just in BIR or DTI offices. Most BIR examiners get flak in the media for being “corrupt and inefficient,” but Abrea believes that something can still be done to improve their performance. “Not that the current BIR examiners are not competent, but they can still improve through better training and compensation,” says Abrea. “If you don't want them to be corrupt, then you have to compensate them well—beyond the Php 15,000 salary most of them are getting now,” says Abrea. BIR examiners will also undergo better training and will even be sent abroad to learn world-class taxation and auditing standards. “This will also give them the confidence to stand up to the big corporations, and lessen the chances for corruption,” he adds. For Abrea, genuine tax reform is not only about lowering income tax rates, but also about building an ecosystem which will make it sustainable. “So for the first three years of the program, our plan is to really lower the taxes. However, the last three years [of the program] will be for building the needed infrastructure to sustain this tax reform,” says Abrea. Part of this tax reform ecosystem, Abrea says, is voluntary compliance from the taxpayers and honesty from the BIR examiners. “If the Duterte administration really wants to push genuine tax reform and to stop corruption in the BIR, then it needs to trust taxpayers to pay their taxes correctly and BIR examiners to do their jobs honestly,” he adds. 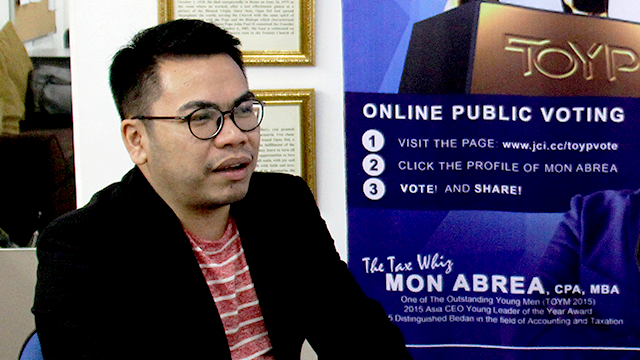 This year, “Tax Whiz” Mon Abrea earned a spot for the Philippines as one of the top 20 finalists for the Ten Outstanding Young Persons (TOYP) of the World. To vote for Abrea and help put him in the top 10, you may visit www.jci.cc/toypvote. For more questions about tax-related concerns, you may e-mail Abrea at consult@acg.ph. Toni Antiporda is a freelance business journalist, and former deputy associate editor of Entrepreneur Philippines. You may reach her at toni.antiporda@gmail.com.